A flight test body for a B61-12 nuclear weapon. Though the following article by Italian anti-militarist Manlio Dinucci takes up the question of deployment of new U.S. nuclear weapons from the point of view of the deployment’s impact on Italy, it remains a condemnation of U.S. imperialist aggression and its dangers for the world. 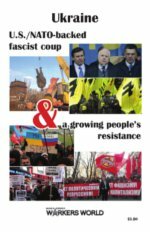 The article was published in the Italian web newspaper Manifesto on Sept. 13 and was translated by Workers World managing editor John Catalinotto. After four years of design and testing, the NNSA gave a green light to the engineering phase that prepares mass production of the weapons. The many components of the B61-12 are designed and tested in national laboratories at Los Alamos and Albuquerque, N.M., and Livermore, Calif., and produced (using parts of the B-61) in a series of plants in Missouri, Texas, South Carolina and Tennessee. Added to these is the tail section for precision guidance, provided by Boeing. The B61-12, the cost of which is expected to run about $8 billion to $12 billion for 400 to 500 bombs, will begin to be mass-produced in fiscal 2020, starting on Oct. 1, 2019. Starting in 2020, it will begin to replace the B-61. According to Federation of American Scientists estimates, the U.S. today maintains 70 B-61 nuclear bombs in Italy, 50 at Aviano Air Force Base [in the Friuli region north of Venice] and 20 at Ghedi-Torre AFB, [near Brescia, west of Venice]; 50 in Turkey; 20 each in Germany, Belgium and the Netherlands — for a total of 180. But no one knows exactly how many there are. At Aviano there are 18 bunkers capable of holding over 70. On this base and in Ghedi, changes have already been made, as shown in satellite pictures FAS published. Similar preparations are under way in other bases in Europe and Turkey. 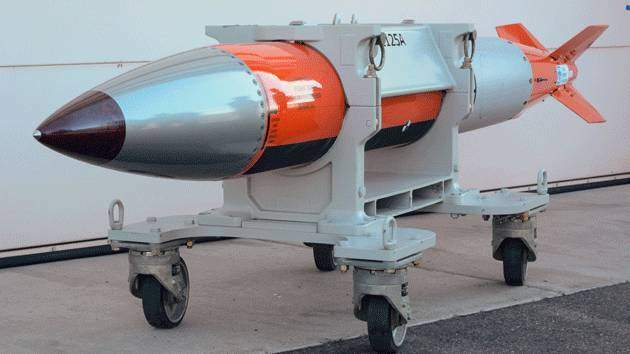 The NNSA confirmed officially that the B61-12, called a “fundamental element of the U.S nuclear triad” (land, sea and air), will replace the current B61-3, B61-4, B61-7 and B61-10. This confirms what we have already documented. The B61-12 is not simply a modernized version of the previous weapons, but actually a new weapon: It has a nuclear warhead allowing selection of four power options, with an average blast power equal to that of four Hiroshima bombs. It has a guidance system that allows it to be launched a long distance from the target, and it has the ability to penetrate into the earth to destroy the bunkers of control centers in a surprise nuclear attack. The new bombs, which the U.S. is preparing to install in Italy and other European countries as part of its threat escalation against Russia, are weapons that lower the nuclear threshold or make the launching of a nuclear attack more likely. The 31st Fighter Wing, the squadron of U.S. F-16 fighter-bombers stationed in Aviano, is ready for a nuclear attack around the clock. The U.S. Air Force says it does not predict when the squadron of F-35s will be combat-proven, but that it is probably during one of its overseas deployments at the beginning of 2017. Italian Defense Minister Roberta Pinotti is hoping that Italy, which has already been “chosen” by the U.S. to install the Muos [a satellite military communications system] that “other nations wanted,” will again be chosen. With the B61-12, the F-35 and Muos on its territory, Italy will also be chosen, by the country under attack, as a priority target of nuclear retaliation.